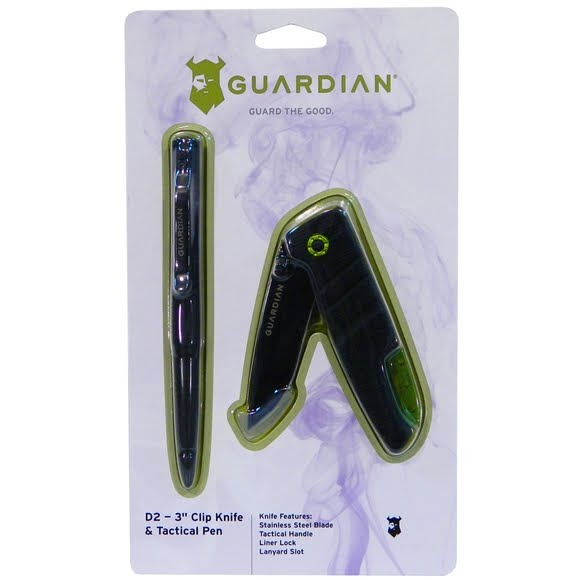 The Guardian D-2 Tactical Clip Folder Knife and Tactical Pen is the most functional set you'll own. A liner locking knife offers a safe, efficient cutting edge for any daily chore while the tactical pen writes perfectly and functions as an unexpected and lethal personal defence or offensive weapon. The Guardian D-2 Tactical Clip Folder Knife and Tactical Pen is the most functional set you&apos;ll own. A liner locking knife offers a safe, efficient cutting edge for any daily chore while the tactical pen writes perfectly and functions as an unexpected and lethal personal defence or offensive weapon.